Lawyers of jailed former PM Ehud Olmert deny report he had classified documents in his prison cell, say it is an attempt to harm his appeal. Former Prime Minister Ehud Olmert's lawyers slammed the Israel Prison Service Sunday (IPS) for banning all visits with Olmert in prison following the discovery of classified documents in his cell. 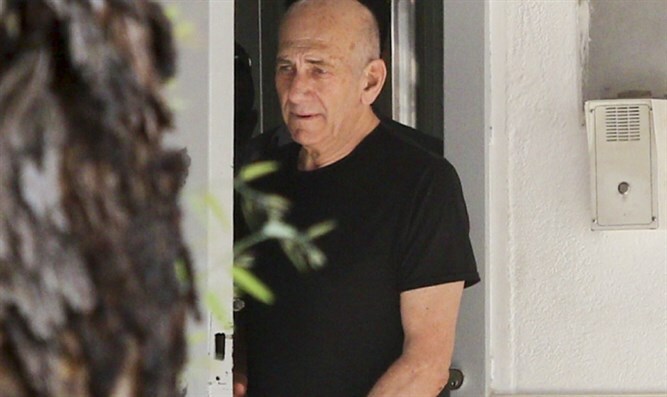 One of the lawyers representing Olmert was caught with classified documents in his possession as he left the prison in which Olmert is serving time, Channel 2 News reported Friday. The incident took place on Thursday, the report said. It is unclear whether the documents had been smuggled into Olmert’s cell or whether he took them with him to prison. The documents were confiscated and transferred to the relevant defense agency for examination. It is now being investigated whether Olmert used the documents to write a book he is currently working on. The IPS announced Sunday afternoon that all visits with the former prime minister were banned. The lawyers denied that any classified documents were transferred. "Mr. Olmert has never brought any classified document into the prison, and Mr. Olmert never had such a document in his prison," the lawyers said. "Unfortunately, this is a false and scandalous attempt to turn Mr. Olmert into someone who supposedly dealt with classified and sensitive documents. It is an experience that provokes disgust and contempt." "For decades, Olmert has been dealing with the most sensitive issues in the State of Israel, and has never been accused of leaking or giving information to anyone in a way that could have harmed Israel, and we reject this attempt by a junior IPS officer to tarnish Mr. Olmert's name and imply that his conduct is a security risk, in order to undermine his request for his sentence to be reduced."